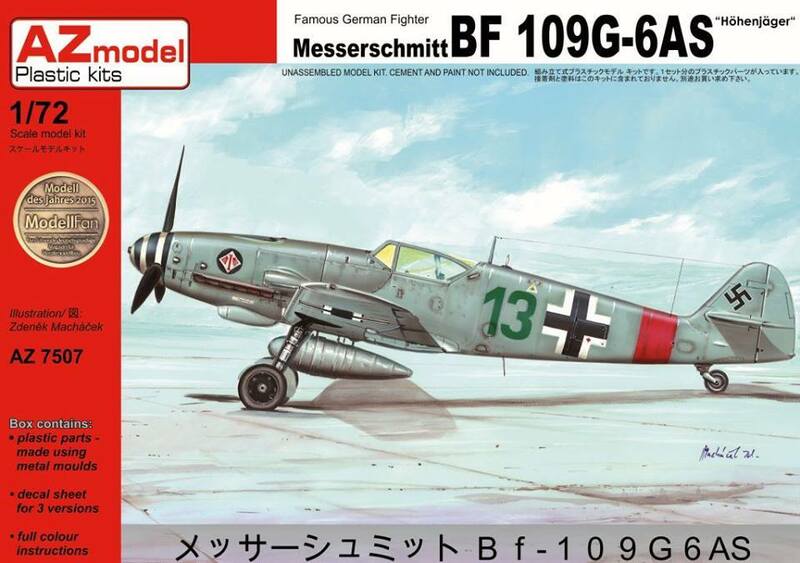 A new release of the nicely done 72nd scale AZ Model Bf 109 G-6, this time in the G-6/AS variant with the refined cowl, tall tail and enlarged supercharger is due imminently. Back in May 2014 we built the 'JG 3 Limited Edition' G-6 boxing of this kit here and I was very happy with the way my model turned out. AZ Model's G-6 series also won 'Model of the Year 2015' in the small scale category in the German 'Modellfan' magazine. As far as I am aware this will be the first G-6/AS variant released anywhere in kit form ..certainly in 72nd scale and long overdue it is too! The first boxing comprises decals for three Höhenjäger - high altitude fighter - machines in the rather rare Hellgrau-über-alles finish, featuring aircraft from JG 3 and JG 1 including Kommodore Oesau's 'Green 13'. 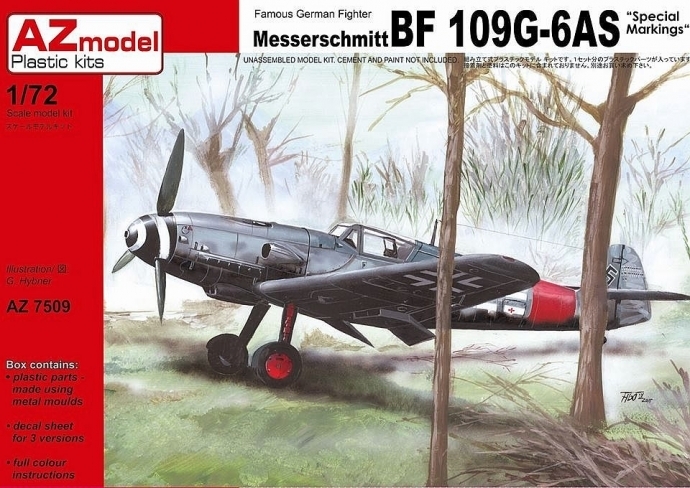 The second boxing features Bf 109 G-6/AS 'Red 2'; this is the 1./NJGr 10 Moskito hunter flown by Friedrich-Karl Müller during July-August 1944 and first illustrated on this blog here by Anders Hjortsberg. See my 2014 'wilde Sau und Moskito-Jagd' article in Model Aircraft magazine for reference photos of this machine. Oberst Walter Oesau of the Geschwaderstab JG 1 was one of the leading Luftwaffe fighter aces and commanders when he was shot down and killed on 11 May 1944. As Jochen Prien comments in his history of Jagdgeschwader 1 (page 926) Oesau's death in combat has been portrayed by many different enthusiasts and writers who have produced a variety of often purely speculative accounts. Steve Blake - the historian of the 354th FG - published his in Aérojournal No.5. It is probably one of the more reliable. What is known is that Oesau was airborne from Paderborn with his wingman Lt. Rudolf Schnappauf during the early evening of 11 May 1944 to intercept Allied bombers raiding north-eastern Belgium and Luxembourg. According to various US accounts he was bounced by up to five escorting P-38s of the 474th FG -or maybe 354th FG P-51s- and chased from high altitude down to the deck. Robert Skawran in his account notes that Oesau was on his own by this stage - Schnappauf had been wounded at the start of the encounter and his machine had sustained damage. Ordered to break off, he had dropped away. The Lightnings took it in turns to put in firing passes; two machines attacking, others waiting at a slightly higher altitude to take over. 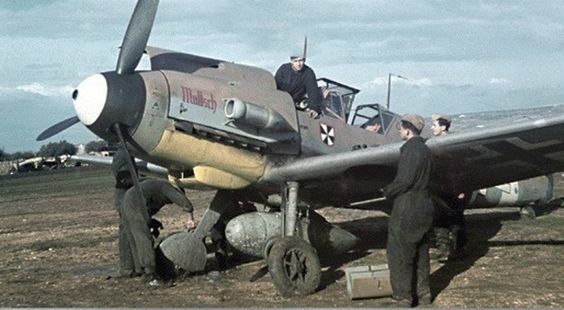 The fight had lasted almost 20 minutes when Oesau's Bf 109 was hit and crippled. Oesau attempted to make an emergency landing and was shot down a couple of feet above the ground. 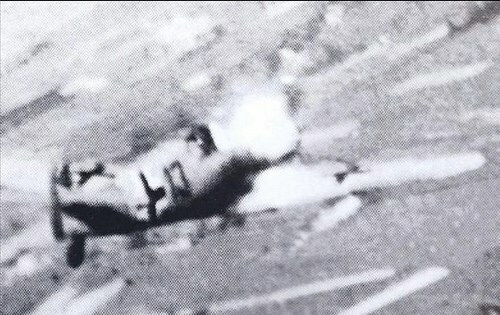 Oesau's body was found in the vicinity of his wrecked 109 with several bullet wounds, presumed shot dead before his aircraft hit the ground. Prien also makes the point (see note 203, page 68 Reichsverteidigung 13/I) that is is almost incomprehensible that one of the leading fighter Verbandsführer (formation leaders) of the Luftwaffe would be airborne on his own with only his Kaczmarek against the Viermotorigen (four-engine bombers) where his leadership skills and experience would be virtually worthless - "..seine Führungsfähigkeiten überhaupt nicht zum Tragen kommen konnten." - and where he would be 'easy meat' for the massed escorts. Why was his Stabsschwarm not based with one of the Gruppen of his Geschwader so that he could lead them in combat? Oesau was flying Bf 109 G-6/AS, WNr. 20601, "Green 13" - the still capture from the US gun camera footage shows a Bf 109 G-6/AS marked Green 13, painted in RLM 76 and a red RVT band. More on the various accounts at the following link..